Great Experience Indeed – Experience India Festival! The weather forecast for Saturday, Aug 22, was pretty clear: clouded and showers pretty much all day, all the time. But we’ve kindly asked Mother Nature: please keep downtown Oakville dry, at least from 9Am to 1 PM, if you don’t mind specifically the Centennial Plaza hosting the Organic Market Farm. And She listened! Sometimes it’s simple like that. This was definitely a great community event and despite the fact that we’ve started a bit later with our agenda, we’ve pretty much accomplished our ambitious goals quite smoothly. Please, check out our photos – see they have also a short description for the snapshots – and let us know your comments, reactions and IF you’ve been “there”, we’d LOVE to hear back about how was it for you, any experience and so on. 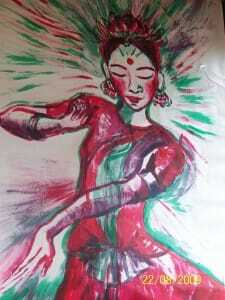 The vibrant lovely dancer above was a gift from Valentina, our talented sahaja yogini that painted it 1 night before with the 2 colours that she only had at that time. Pretty powerful! We had also Oakville Beaver newspaper coming by and taking some snapshots. The reporter had actually tried on the spot the sahaja yoga meditation workshop offered by Vassili – our friend that is also a massage therapist in Toronto. Dr. Nishi was also nearby, helping at our Wellness station with advises, so the moment was perfect to have her interviewed! Please, keep an eye on the Oakville Beaver this week and let us know if you see any word on our lovely colourful event. It would be really nice to save few newspaper copies for our special guests! It would be really lovely to have YOU writing actually this article by providing your feedback. So far we’ve had great feedback from everyone, from the vendors that were in the plaza and that applauded our great Chello Sahaji Band and that even started dancing when we had the “stick dance” moment. Then even the Sun came quickly from the clouds to watch our joy and warm our hearts. it was so much joy. 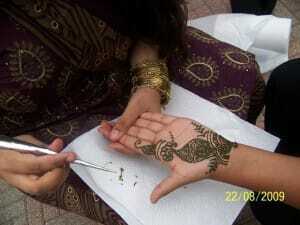 The Station for Cool Kids with Henna painting and spontaneous meditation workshops was really another great success. People, children, teenagers would line-up for it. This young lady is checking out if there is coolness coming out from her Mehndi and Yes, it does! So all her friends wanted to try sahaja yoga meditation workshop after that… so they learn how to stay cool! Judge for yourself how beautiful art this is when is performed by inspired ones like Khaty-See? Of course, we had collective Kundalini workshops, Indian instruments were introduced to the public, we had so many people that wanted to enjoy the Spontaneous meditation and they were impressed that sahaja yoga is “local” and it is always offered for free. We’ve had many requests for a CD with the music that was offered by our amazing Bhajan group – Chello Sahaji – that has all its members joyfully practising Sahaja Yoga Meditation. That’s why we’ve heard again and again: “You guys have such great vibes!!!”. Good news for those interested and reading this article: they are working on having pretty soon a release of their 1st album that will include the most popular songs. Stay tuned, we’ll make sure to inform you promptly. Also videos from this event will come soon. Now, it’s your turn. Share your “Experience India” impressions and stories. Let’s keep dancing!! Beautiful,colourful photos! I am happy the day was a successful one. The music was really beautiful, and healing. I helped give realization to a few open-hearted souls in the morning. They both felt great relief afterwards. I am proud to share the news that everyone is born with kundalini energy inside of them! 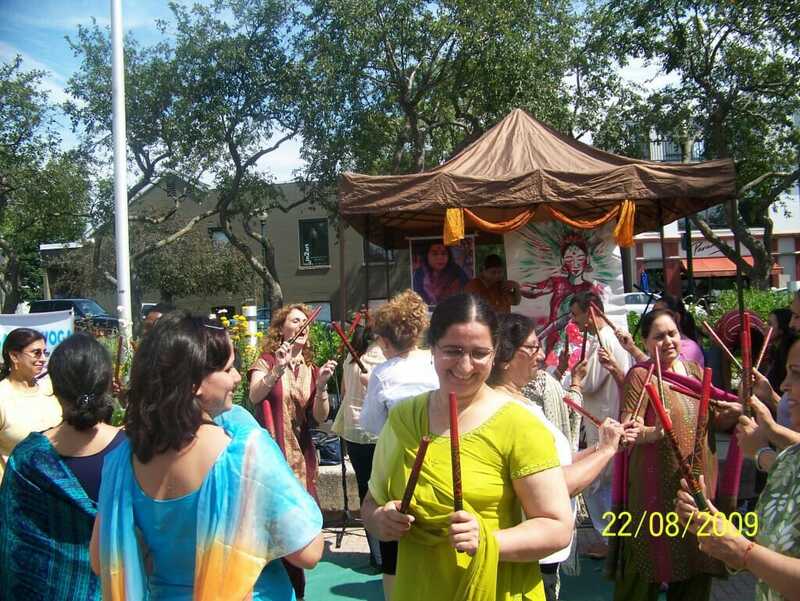 And I am so proud to share that the sahaja yoga classes are absolutely free to the public and evolutionary! I have my own proof in my life, simple miracles that are moving me towards an evolutionary path. Plus I bought some delicious spices. I had the privilege to taste the chai tea in Shri Maataji’s castle in Cabella, and I wanted to bring that home, so I found it at the festival! It’s delicious! keep up the good work you guys are doing wonderful jobs. Andrea ( says: I came by with my two daughters after our soccer game, had some lunch and enjoyed the dancing. It was such a great pleasure to enjoy with my Sahaja family giving self-realization to the wonderful people of Oakville at the India Festival held at the Oakville plaza. Everything was so beautiful and the vibrations spread out all over on the shinning faces. I look forward to the upcoming children’s festival on Sept 5th “Cool Rhythms for Kids” and enjoying all the fun and games planned for everyone.